What to do on holiday in Quercy? 2-meter beds, washing machine, high chair for baby. Fully fitted kitchen, freezer. TV, DVD, mini HIFI, Internet access. The day I saw this rural cottage I immediately falled in love with it. It was really in poor shape: leaking roof, falling walls, broken doors and windows, no running water. Let's not forget the car and tractor wrecks. And everything was lost in the middle of bushes. But there was a "je ne sais quoi", a feeling of peacefulness, of natural quietness. I am living abroad, and this could be my harbour in the region of France I come from. We did a lot of renovation work. And when I am not coming back there I open it to guests. Let's be honest: it helps me pay part of the bills too :-). Today I am glad that so many of our visitors feel at home when they stay in the "gite" (self-catering cottage for vacaton rental in French). Because this is what we focus our effort on. My parents will use their best English to welcome you and count on your forgiveness. You will find several guides for walks or bike rides in the self-catering cottage. Plenty of opportunities to discover the rest of the Parc Regional des Causses du Quercy. - 50 m2 per floor, 2 floors. - 1st floor: 2 bedrooms (2 single beds 2m X 0.9m in one, 1 double bed 2m x 1.6m and bed for baby in the other) and 1 single bed on the staircase landing. Wooden floor in chestnut tree, oak beams. - ground floor: the original stone pavement has been kept in the living room. Tiles in the kitchen/dining room area. Ceiling in wood and oak beams. - for your comfort: WC separate from the bathroom. Washing machine, iron and board. Baby chair. Fully equipped kitchen: micro-wave, oven, cooker, expresso, dishwasher, fridge and freezer. In the living room: TV set, video-DVD player, mini HIFI with ipad/iphone docking station. Bed linen, bathroom towels and kitchen linen, cleaning products, tourist tax, 100 kWh electricity and water included in the price. 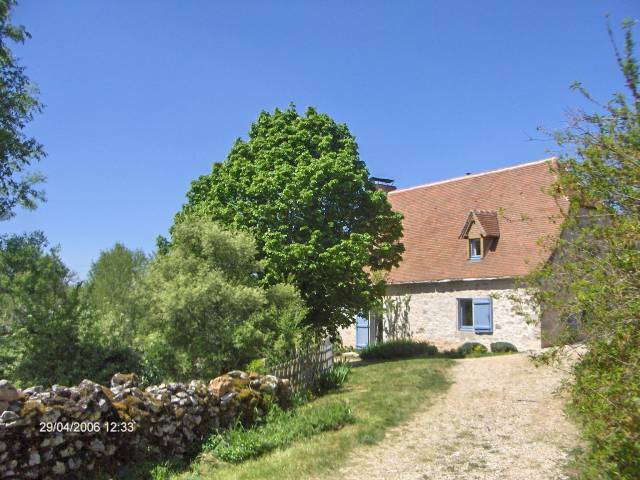 The rural cottage “Au Lac de Blars” is in the middle of the Quercy and the Lot department, next to Dordogne and Perigord, in the south-west of France. Located in the center of the Regional Park, between Cahors and Figeac, the two main cities of the department. It is in easy reach from Paris (5 hrs) either by the A20 motorways or by train. You can also fly to Toulouse (150 km) or Brive (70 km). Dears sometimes come for a drink at the pond, or for a rest under the lilacs. The rest of the garden is typical of the local vegetation: the “dry prairie” of very short and dry grass, the oaks, maple trees and other local species of trees. At the limit of the property, cross the road hidden behind the row of trees and take the path to the larger pond called “Lac de Blars” which gave its name to the cottage. Preparing vacations takes time so we take care of you before your vacations start. Upon confirmation of your booking I will send you a welcome pack with practical information about the house and the local facilities (doctor, bank and ATM, local supermarket and gas station). 6 weeks before your arrival i will send you suggestions of visits as well as tourist information. About 2 weeks before your stay I will call you to answer your last minute questions. Of course i remain available at any time on the phone (00 32 497 413 809) or by email should you have any question. Upon arrival we will be pleased to offer you a bottle of one of my preferred Cahors wine, for you to enjoy with local specialities. Booking on line is not yet open for 2015. Send me an email at booking@gites-quercy.com or call 0032 497 413 809 for an answer by return. If you confirm interest we will take a booking option until all paperwork is done. Included in the rent: electricity up to 100 kWh, bed linen, kitchen towels, bath towels, cleaning and washing products, tourist tax, Pass-decouverte Lot (a booklet of vouchers offering discounts for 29 site visits and activities). Additional rental Charges: electricity 0.10 €/kWh (first 100 kWh free), wood for fireplace & stove 15 €/quarter of m3 (usual consumption in heating season is 1/4 to 3/4 m3 and a few euros of electricity). Guarantee deposit: 300 € (refunded at end of stay after exit check). End of stay cleaning: 35 €/stay. How much will cost your stay: on top of the rental and cleaning cost, probably 0 in the summer, and from 20 € to 50 € from mid-September to mid-May included.